I can't believe today is the last day of 2015. That's so crazy, right? This year just really flew by. I think I say that every year, but this one really did. See, this year, I was really trying to hold on to every moment. We're married without children, and I know this time in our life won't last forever. So I wanted to make sure that I really soaked it in, appreciate the fact that we can sleep late on the weekends and travel whenever we want (as long as we have a cat sitter, anyway). This year, my parents retired and had a house built down the block from us. Every Sunday, I went to their house to see what construction had happened that week. It was incredible to watch. And a week or so after their house was done, Pete and I bought the lot two down from them. So for the last few weeks, I've been watching our house be built. I'm really enjoying it and really just appreciating the exciting moments and the mundane ones. Like last week. I was watching my 94-year-old grandma and we went out to Waffle House. She said she could walk from the car to the restaurant, but she needed a little help stepping up the curb. This pair of older gentlemen were at the car next to us and jumped at the chance to help her ... and grab her booty. Seriously. When this one man helped her up, he did so by grabbing her tush. Payment for his good deed, I guess. Realistically, did I have time to go out to dinner with my grandma every night (after shopping every day)? No, not really. I should have been working. Blogging forces me to sit in front of a computer for fourteen hours a day. And that's what I should have been doing last week as I grandma-sat. But instead, I went out to dinner every night. Because you know what? I can work anytime. I can work weekends and when the rest of the world sleeps. But what I can't do is hang out with my grandma at any time, especially just me and her. So that was my 2015. Trying really consciously to just be present and enjoy the moments. Your 2015, dear A Bride On A Budget reader, was spent reading old posts. Seriously. I went through our posts to find the most read from 2015. To my surprise, of the top 20 posts you read this year, only one was written in 2015. The rest were from the past. So I have two year end wrap up lists. The first is the top ten posts read in 2015 and the second is the top ten posts written in 2015. 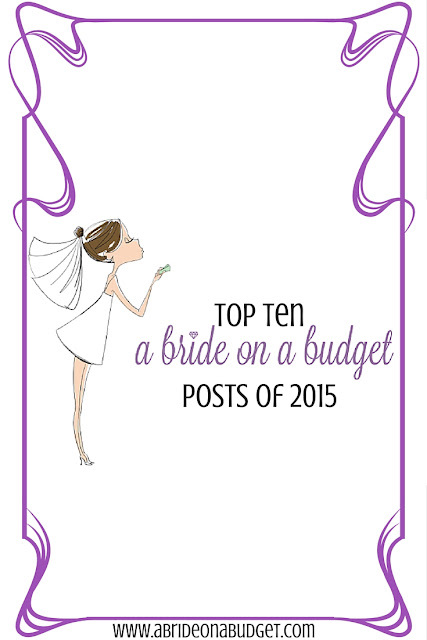 BRIDAL BABBLE: Which of these posts from 2015 was your favorite? What a great year!! Happy 2106. Congrats Elizabeth! If I can help in any way, let me know! My sissy just got engaged, so I am forwarding this post to her, thanks for sharing, found you at Home Matters! Congrats to your sister! If I can help her at all, tell her to email me! Oh my goodness I need to tell my daughter about your blog! She is getting married in August and it's a DIY on a budget wedding all the way. So many great tips in here! If she needs any help, please have her get in touch (or you on her behalf!). It sounds like you had a great year!I hope 2016 is even better for you!Thanks for sharing at Celebrate It! Thanks so much Teri! Happy New Year to you as well!